After leaving Egypt on the first day of Passover, we counted 49 days in eager suspense. Then, on the 50th day, we assembled in the same spot where G‑d first spoke with Moses, and we received the Torah. Why 49 days? The Kabbalah describes 49 facets that make up the human character. Each day that we counted, another facet of our nature was uplifted, bringing us one step closer to receiving the divine transmission to humankind. Blessed are You, L‑rd our G‑d, King of the universe, who has sanctified us with His commandments, and commanded us concerning the counting of the Omer. May the Merciful One restore for us the service of the Holy Temple to its place, speedily in our days; Amen, Selah. Click here for the daily updated Omer count, along with the blessing and traditional prayers. Click here to sign up for daily Omer email reminders. The custom is to count during the evening prayers, but it can be done all night. Forgot to count the Omer? 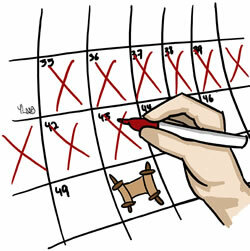 Count the following day, but without a blessing. On the next nights, continue counting as usual. Missed counting in the daytime, as well? Continue counting the rest of the nights, but without a blessing. I Keep On Forgetting To Count the Omer! Email reminder! Chabad.org spoils us so much! Thank you for this great article and also the link to the email reminder.